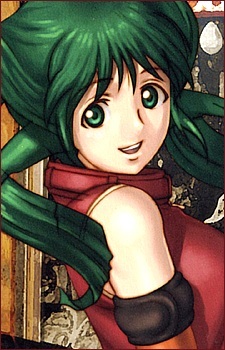 A Genuine Resemble (gynoid) with green hair and green eyes. She does not remember anything from before her first meeting with Roy. After indirectly saving Roy's life (and then directly once again), she takes up residence with and is later adopted by him, causing her to take the surname Revant. Possessing a cheerful, helpful personality, she generally spends time cooking or performing housework for Roy, and later, Rose. She is naive and takes every opportunity that presents itself. Her construction allows for a number of superhuman abilities, including high resistance to injury, greatly enhanced strength and speed, and the ability to resonate her fists to disintegrate objects. Her first name comes from one of Roy's old records, "Solty Rock". It is later revealed that her real name is Dike.